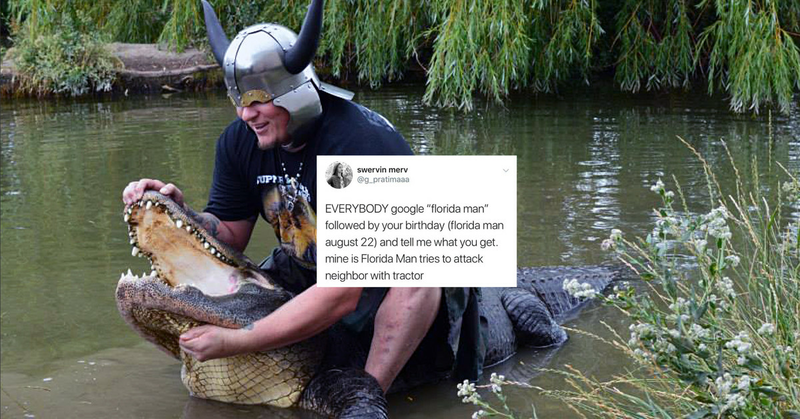 In fact, this has become such a recognized phenomenon that there’s actually a subreddit dedicated to chronicling all the absolutely insane things that “Florida man” gets up to. And the latest way that people are using these hilarious headlines are by googling “Florida man” and the day they were born to find ‘their own’ Florida man headline. You know how people save newspaper clippings from the day their kids were born? This is kind of like that, but way funnier. These headlines don’t even look like real events, they look like someone just mashed the predictive text button on their smartphone and after stringing a dozen random words together went, “yup that’ll do”. I’m glad whoever wrote this story specified the exact color of the iguana because man it would’ve been a lot weirder if the toilet lizard was like, orange. Okay honestly though this one is understandable. Who among us hasn’t made some mistakes just because they’re hungry? I… have questions. Ultimately though I am kind of impressed. HOT SAUCE!! The real hero of our time. There isn’t any footage (I checked) but I’m sure Florida man fought valiantly.